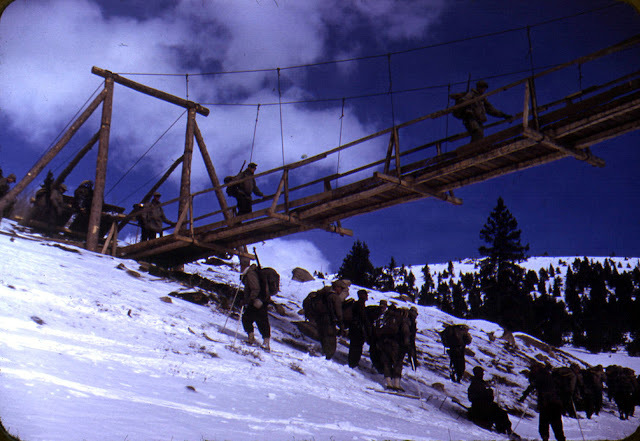 View of skitroopers testing an experimental wooden bridge built by the Engineering Battalion of US Tenth Mountain Division at Camp Hale Colorado, 1943 or 1944. A line of men are crossing the bridge and more troops wait below. Snow covers the ground. In September 1942, the 126th Engineer Mountain Battalion, with Lieutenant-Colonel John Parker in command, is activated at Camp Carson and becomes part of MTC (Mountain Training Center). 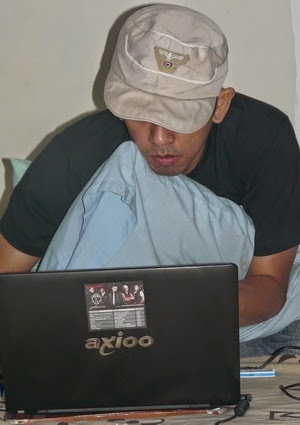 Initially, two companies are authorized. Company A is to do experimental work on the construction of aerial tramways. Company B is to experiment with the construction of suspension bridges in mountainous terrain. One consultant to both groups is Major Frederick Roebling, a member of the famous family of engineers. The 126th received a fourth company, which infantry division engineers lacked, giving it one motorized (Co D) and three pack companies. Between November 1944 to November 1945, thay had at least 31 officers, 2 warrant officers, and 749 enlisted personnel.